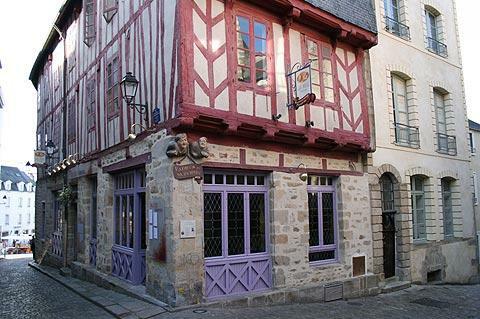 Vannes is found on the southern coast of Brittany, and is a sizeable town - and also the capital of Morbihan. 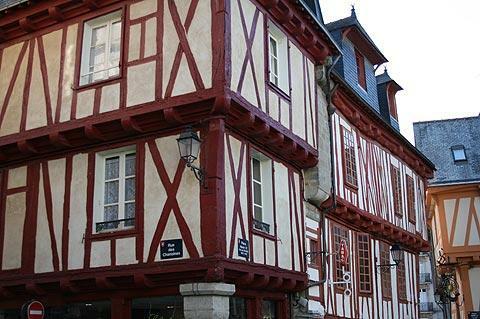 Vannes is also one of the unmissable highlights of a visit to Morbihan. There is a great deal to discover in this fascinating and attractive historical town, so allow plenty of time to explore properly. 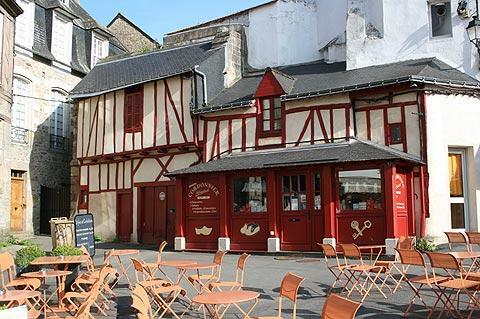 Start your visit perhaps at the port, in the south of Vannes. Newly renovated this is an extensive harbour full of boats with a long walkway that follows along the sides of the harbour. This walkway continues on into planted avenues of trees, and if you are feeling energetic it continues for several kilometres until it reaches the popular port and peninsula at Conleau (also recommended). 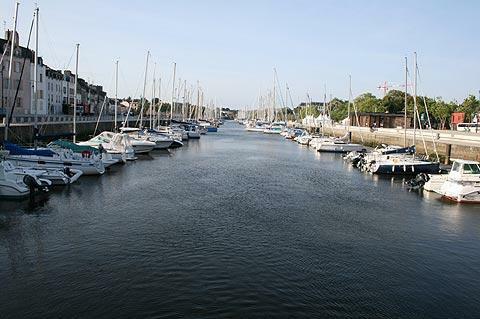 The Vannes Tourist Office is also situated along this harbourside walkway. 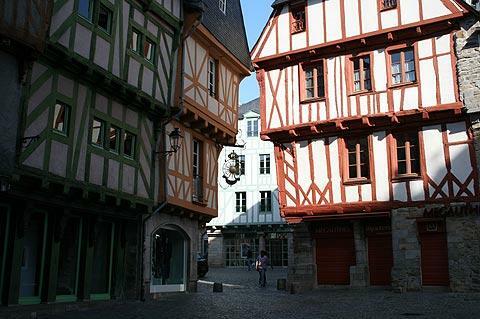 You can enter the old town through the medieval gate at the northern end of the harbour to discover some very attractive streets to explore, with numerous colombage (half-timbered) houses, making it one of the prettiest towns in Brittany. 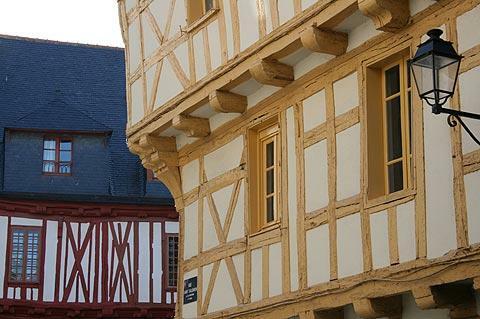 Several of the houses also feature old wooden carvings and other features - the best known of these is a carving of a man and woman known as 'Vannes and his wife'. This 16th century house has been greatly modified over the centuries - principally with the addition of large windows and a shop front - but is still very charming. You can also see houses with slates hung from the front of the building, another traditional Breton architectural trend. The ground floors of the houses contain an extensive selection of shops, boutiques and cafes so it is never difficult to find somewhere for a pause! 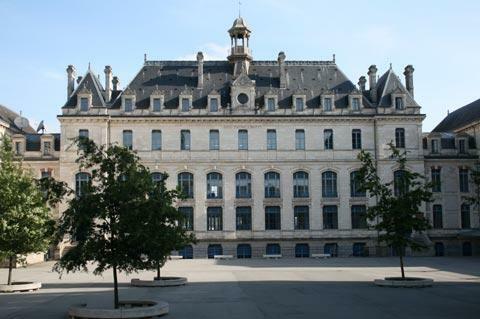 Leave the old town for a while by the north-west corner to see several more recent 'important' buildings including the Hotel de Ville (Town Hall), the 16th century townhouse called the Hotel de Limur; and a very impressive College (just right of the Town Hall). 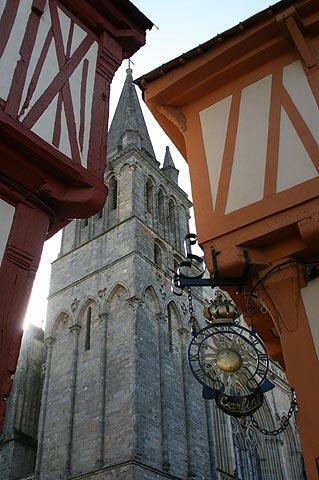 Re-entering the old town but this time keeping to the east, head next towards Vannes cathedral. The cathedral is an interesting mix of architectural styles and a particular highlight is the Chapel of Thomas Ferrier, built in the 16th century but beautifully light and airy. If you keep walking towards the east behind the cathedral and along the Rue Porte Prison you will find another of the original gateways into the town at Porte Prison. 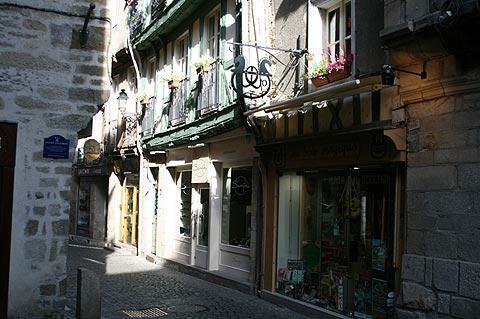 From here you can follow the road outside the original ramparts that once protected medieval Vannes. 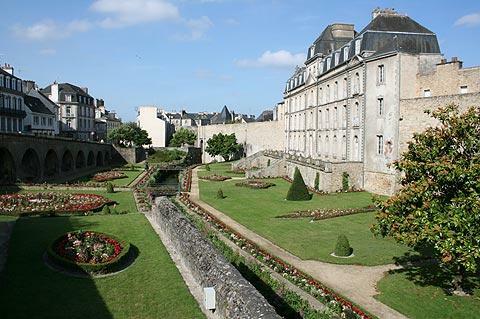 The walls are very impressive in themselves, and further enhanced by the gardens below the walls and further extensive formal and informal gardens running up the hill behind the prefecture (road opposite the Porte prison). 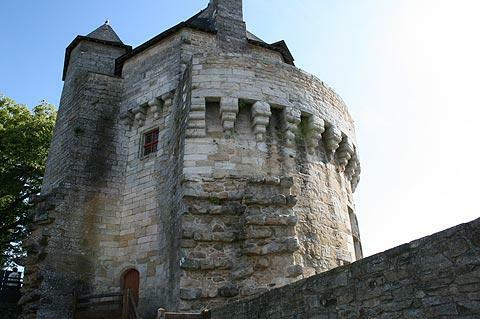 Follow the ramparts and little river to see the sturdy tower in the walls called the Tour de Connetable de Richemont. This imposing tower of five stories was built in the 15th century and was used by the head of the Duke's armies and has retained many of its original features, such as the defences you can see on the outside of the tower. In fact the tower was originally part of the courtyard of nearby Chateau de l'Hermine. 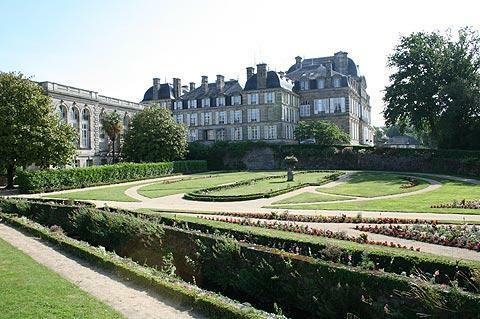 From here you can follow the 'promenade de la Garenne' with nicely maintained gardens in the castle moat and you will soon reach the pretty little buildings next to the river which are the original lavoirs (washhouses) for Vannes, and re-enter the old town to continue exploring the pretty medieval streets. The Museum of Fine Arts is directly opposite the cathedral in a medieval covered market and contains an interesting collection of art from Delacroix to modern contemporary works. 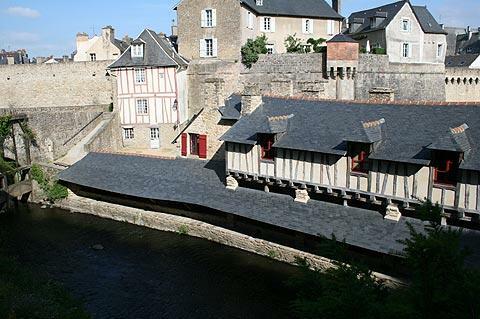 Another noteworthy museum in Vannes is the Museum of Archaeology in Morbihan in the beautifully preserved Château Gaillard and featuring prehistoric artefacts as well as furnishings and items from the 15th-18th centuries. The Château Gaillard is more of a grand town house than a castle, and recognisable by the full height five sided tower that dominates its facade. 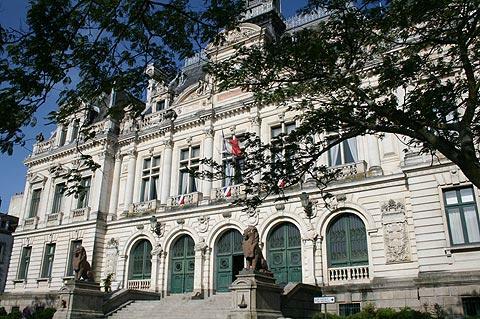 It originally housed the Breton parliament. As we mentioned, the port at Conleau is a worthy side excursion. 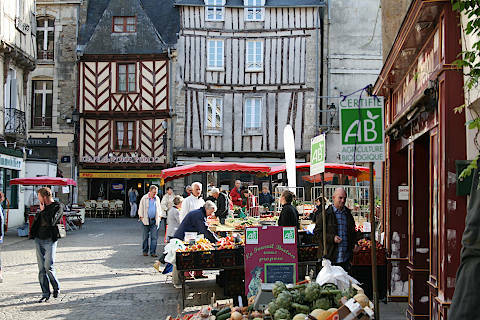 If the crowds in Vannes become a bit too much, set off for the port, then take a boat trip around the islands of the Morbihan Gulf, or perhaps visit the Ile-aux-Moines or the Ile d'Arz. As your boat carries you around the little islands you see all kinds of neolithic ruins and standing stones, many in the process of becoming submerged by the rising seas. Fascinating. Another island well worth taking a boat trip to is Gavrinis, famous for its neolithic monument - in this case a chamber, where you can still see decorative carvings on many of the rocks. The Rhuys Peninsula, heading towards Arzon and Port de Crouesty just south of Vannes is interesting because it is warm enough from gulf stream currents to grow figs and pomegranates, vineyards and bougainvillea (the last is incredible - these don't survive in south-west France). While you are on the peninsula, you should also take the time to visit the Chateau de Suscinio, a fine 14th century moated chateau, to follow the coastal paths a little (see the individual place guides), and of course to spend some time on one of the many fine sandy beaches.